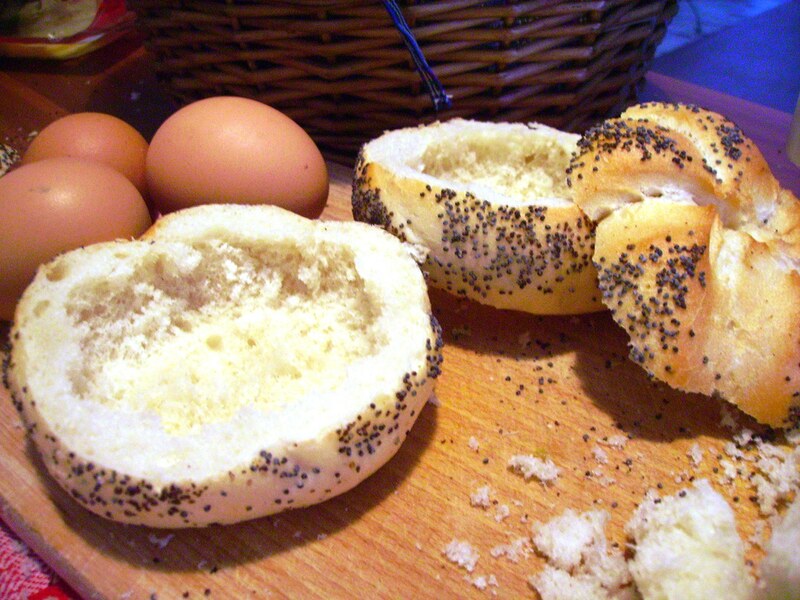 This entry was posted in Bacon, Basil, Bread & Grains, Breakfast, Breakfast Sandwich, Cheese, Cooking, Cuisine, Eating, Eggs, English Bacon, Food, Herbs & Spices, Meat, Parmesean, Recipes, Rolls, Sandwiches, Thyme. Bookmark the permalink. so I made this and it was delicious. Best served without the newspaper! I put up some photos on my blog. My little girl loved helping me with this one. thanks again for the recipe. 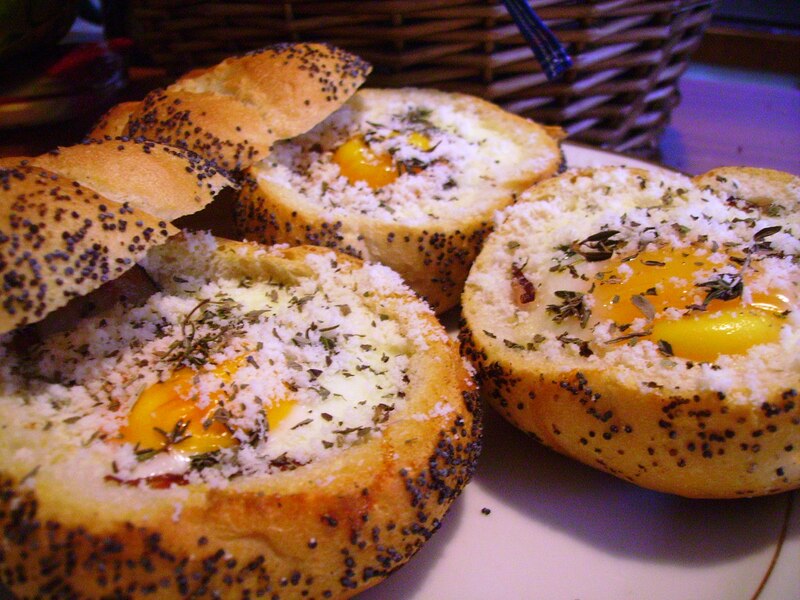 Wow, that’s such a cool version of ‘egg in a basket’! I always use rosemary and cheddar instead of thyme and parmesan, but this looks delicious too! And as a vegetarian, I leave out the bacon of course – but you can get a bit of this flavour by using smoked cheese. 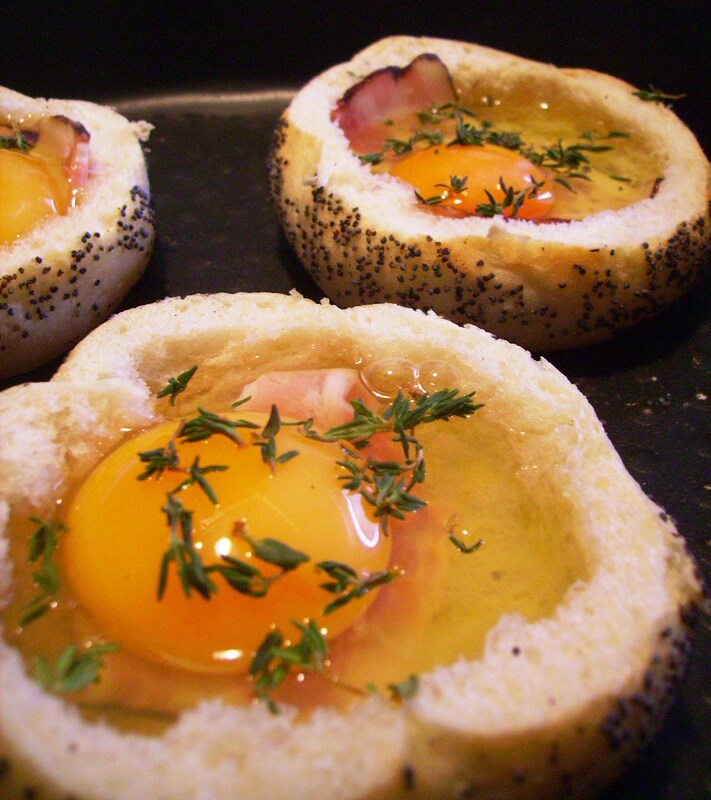 Wow, I’ve seen eggs baked in the oven before but never like this! Looks like a perfect thing to take out on a picnic too, thanks for the idea, definitely going to try this! Thanks Charles 🙂 Plenty of variation opportunities on this one as well. Oh how I love eggs. What beautiful pictures. Thanks 🙂 I love eggs also. This looks delicious! I’ll be making this as soon as Lent is over and I start eating meat again. Mmm…I could eat that everyday and twice on Sundays. Twice on sundays sounds like double the fun 🙂 Thanks for popping by Jeffey. Simple & delicious. You just can’t beat it. I LOVE breakfast sandwiches, and I sure wish I had this one right about… NOW. Mmmm I love different and easy ways to make breakfast. They look really great! Thanks Amanda 🙂 I am sure you can come up with some different ways to even make this. I have been experimenting all week. heehee! perhaps I should have said “while reading the paper”… Either way I am sure it will taste good. I am going to make this on Sunday! My husband will love it! Looks like it will go perfect with a fresh pot of coffee and newspaper. I’ll take two! Hold the newspaper!